DAYTON, Tenn. – On Thursday evening, the Bulldogs from Tennessee Wesleyan made the short trip from Athens, Tenn. for Bryan College Volleyball’s home and Appalachian Athletic Conference opener. The Lions showed true grit in the opening frame after trailing 23-24 and battling for three unanswered points to seal the set 26-24. An early surge by the Bulldogs helped them claim set number two 25-19, tying the match 1-1. Once again, Tennessee Wesleyan gained momentum quickly, which proved too much as they went ahead 2-1 with a third set score of 25-16. Bryan trailed 18-23 in the fourth frame, and the end was in sight, but that didn’t prevent the Lions from going on the attack. The home crowd cheered on Bryan as they pieced together an impressive 9-2 run to swipe the fourth set 27-25, forcing a fifth. 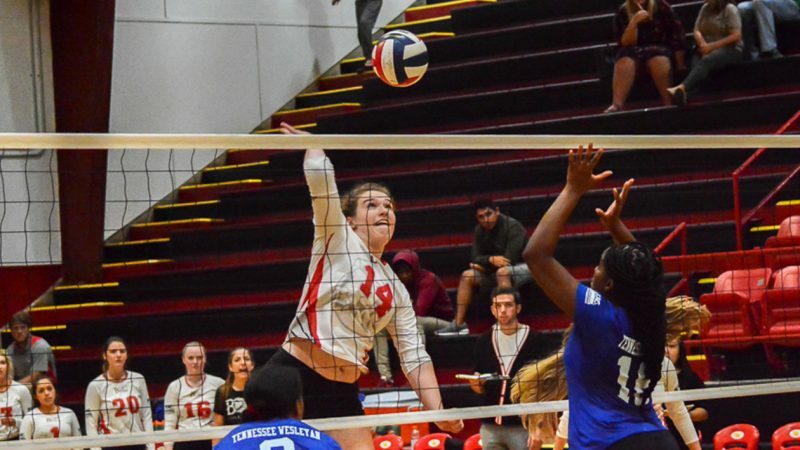 The Lions found a rhythm and used it to go ahead 11-9 in the final stanza, but the rest was all the Bulldogs as they notched six straight points to win the set 15-11 and the match 3-2. The loss put Bryan at 3-6 overall and 0-1 in conference play, while Tennessee Wesleyan improved to 5-9 on the season and 1-0 in the AAC. Two Lions recorded double-digit kills with Anna Owens tallying 12 and a .147 attack percentage, followed by Mariah Dunlop with 11 and matching Owens with a .147. Paige Randolph was unable to go positive on the attack, but she aided with eight kills. Rebecca Camacho produced a notable seven kills and .417 average. Next was Emalie Hicks who rose up and put away six kills for a .087 average. Others to support on the attack were Janie Smith with four, Jennifer Keck with three, and Rheagan Kean with one. The Lions ended with a team attack percentage of .132 compared to the Bulldog’s .224. Bryan’s assists’ leader was Keck who served up 36, while Sidney Pierce chipped in nine. Kean was all over the court, corralling 29 digs for a team-high, and was trailed by Keck with 10, Megan Martinez with eight, and Macenzie Krause with seven. One area of the game that hurt the Lions was their one defensive rejection, while the Bulldogs totaled 11 blocks. Bryan gets one day to rest before continuing AAC action at home, as the Lions play host to Bluefield College this Saturday, Sept. 8 at 2pm. The Rams currently own an overall record of 2-5 and conference mark of 0-1. For a complete look at the 2018 Bryan Volleyball schedule, click here.